Quiz: Are You Keeping Your Hair Young and Healthy Looking? Home > Appearance > Quiz: Are You Keeping Your Hair Young and Healthy Looking? The focus for anti-ageing often falls on skin and body with many people ignoring their hair. People will spend a lot of money purchasing expensive creams and having treatments for their skin, as well as procedures and activities for keeping their body looking trim and toned and youthful – but spend little if any time on their hair. If you add this to the fact that a lot of hair has to withstand harsh ‘attacks’ from heating implements, dry atmospheres, environmental irritants and pollutants as well as physical stress (eg, tight buns, constant cap use) – it is little surprise that so many people complain of dull, lacklustre, thinning hair. However, having a full head of thick, shiny, healthy hair is one of the key aspects to looking youthful and attractive. So are you doing everything you can to make sure that your hair remains looking young and healthy? 1) How often do you blow dry your hair? 2) What are your sleeping habits? 3) Have you ever permed your hair? 4) How much exercise do you do? 5) Have you ever dyed your hair? 6) How would you describe your diet? 7) What hair styling products do you use? 9) How stressed do you feel? 10) Do you drink a lot of coffee or other drinks high in caffeine? Heating implements and styling appliances such as hair dryers, straighteners and curlers, can cause damage to your hair shaft and result in dull, dry, lifeless, frizz hair. You can prevent this by limiting the amount of heat your hair is exposed to – for example, letting your hair partly dry naturally before using the hairdryer and holding the tool further away from your head. Also, try to use the lowest possible setting needed to achieve the look. Try to avoid using hair dryers or straighteners every day but if you must use them regularly, consider investing in hair protection products such as heat-activated leave-in conditioners, as well as periodic deep conditioning treatments. However, these products can only protect up to a point and excessive frequent heat will still cause damage, regardless of how much product is applied. Note also that excessive use of leave-in products can cause hair to become limp and greasy. Remember also that using very hot water to wash your hair can have a similar damaging effect. Erratic sleep patterns and sleep deprivation can lead to brittle hair and even accelerated hair loss. While everyone needs different optimal amounts of sleep, most people will benefit from 6-8 hours daily and a regular routine. Not only does sleep contribute to healthy, beautiful hair, it also reduces stress levels and enables your body to repair and regenerate. Regardless of the skill of the hairdresser and the condition of your hair prior to treatment, any perm is guaranteed to cause damage to your hair. It is just impossible to apply a chemical treatment to hair – especially one as powerful as that needed to break the natural bonds and texture – without causing damage. This does not mean that you should never perm your hair but it is something to be aware of – and perhaps consider limiting the number of perms or using alternatives, such as curling irons or rollers or even hair attachments for a more temporary transformation. 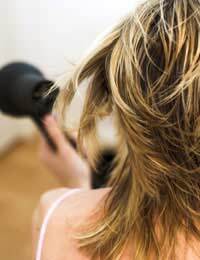 We all know that regular exercise is vital to our well-being and hair is no exception. Why? Because exercise boosts circulation, which in turn ensures healthy hair. In fact, hair condition is often a barometer of overall physical health. You do not have to be a gym junkie to have lustrous hair – just ensuring that you do some form of exercise for at least 20-30mins a day, three times a week, will make a huge difference. Like perming, dyeing your hair involves applying chemicals which will invariably damage your hair. In particular, changing from a dark hair colour to a lighter one requires first bleaching the dark colour out of the hair shafts, before introducing the new colour and this is a very harsh treatment. Studies have even suggested that heavy use of hair dye may cause cancer in some people. Naturally, deciding to dye your hair is a personal choice and you will have to weigh up the risks but it may be a good idea to limit exposure to hair dyes – perhaps take a break from dyeing and revert to your natural colour for a while or use gentler treatments, such as henna-based products which are plant-based and believed to be safer. therefore a poor quality, unbalanced diet will likely show up first in dry, brittle, dull, lifeless hair. Using the best hair care products in the world will not make much difference if you are not nourishing your hair from the inside. Aside from eating a balanced diet high in fresh fruits and vegetables, studies show that eating good sources of protein, such as fish, eggs, beans and soya (tofu) can help to promote hair growth. Less is more. Applying too many styling products can actually make hair look worse – weighing it down, making it greasy and limp. At least once a week, wash your hair thoroughly (and rinse very well) to remove all traces of product build-up and then allow your hair at least one day completely free from products to “breathe” and recover. You may be surprised at the results from allowing your hair to go completely “au naturel” for a while. There’s no beating about the bush: smoking kills your hair. There have been conclusive studies which show that smoking restricts blood flow and damages capillaries – it accelerates hair loss and premature greying of the hair. No long-term smoker has healthy, beautiful hair. Stress affects us adversely in many ways and hair is no exception. Stress can have a direct effect, such as oily scalps, but it can also cause other symptoms such as poor sleep and appetite which then have an indirect effect on hair health. Find ways to manage your stress and not only your hair but your whole body will thank you for it. Just like nicotine, caffeine can wreak havoc with your hair health. So consider cutting back if you are not able to eliminate it from your diet entirely. Having beautiful healthy hair is about more than just having expensive salon visits and using expensive hair products – it is also about adopting healthy habits which nourish and protect your hair from within and without. Do I Have to Cut My Hair Now That I'm 40?